The highly accurate quartz regulated Astrolabium has a month and zodiac disc and a sun, moon and earth ball. 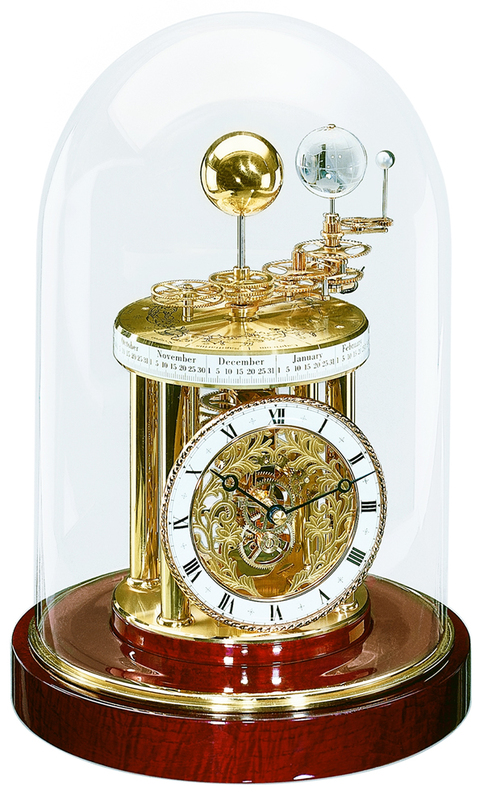 Through the visible highly intricate gear train system, the Astrolabium clock reproduces the annual orbit of the earth around the sun, with the earth rotating around its own axis once in 24 hours and the moon revolves around the earth in 29.5 days, completing a full rotation around its axis. In the course of one year, the earth passes all twelve zodiac signs, months and individual days, which are indicated on the brass disc. Movement: Hermle quartz skeleton movement 2987, display: month/date/Zodiac etc. ; Battery: Alkaline battery, operating time 1 year. Glass dome: The crystal dome is mouth blown and can therefore have little bubbles and other minor irregularities, which is characteristic for this kind of production.